Thomas E. Sniegoski has written seven novels about Remy Chandler, a Boston private investigator who also is the angel Remiel. His idea of an angel renouncing heaven and coming to earth to live life among the mortals is an intriguing one, and I have been following it through this latest book. As someone raised in a parochial school, I relish his archaic biblical stories and myths about angels and demons. The world he has created seems solid to me, and Remy as a character is about as human as one can be. More than any other character in the book, however, Marlow captures the essence of Sniegoski’s genius. 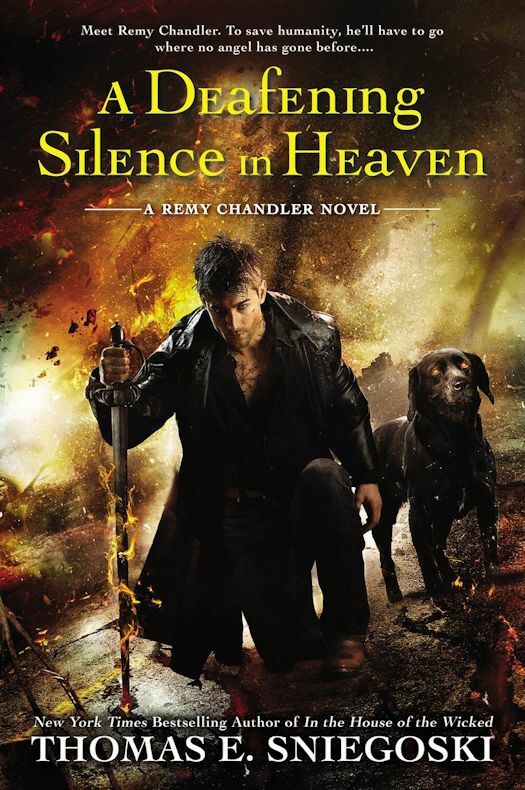 As an angel, Remy has the ability to speak to all the creatures of the earth, and Marlow is his beloved lab. Marlow is a gentle soul who can be driven to protect his beloved humans, and his observations about humanity are spot-on. In this particular outing, Remy has been wounded by an assassination attempt from a group of assassins who never give up and will not be called off of their assignment. As he lays unconscious, his friends must protect his body while his mind is directed to an alternate history – where Heaven and Hell has failed to reconcile and everything has fallen apart. For the first time, Remy’s extraordinary skills cannot save him – he has to rely on his friends, some human and some not, to keep the assassins away and to help restore him where he belongs. I really enjoy the characterizations in these novels. Remy is unique in that after thousands of years, he still is not familiar with all the human emotions. For the past 60 years or so, Remy has been married to his soul mate. Since she dies in the first novel, Sniegoski explores grief and its effects during his tales. More than once, Remy debates whether it is worth experiencing all that human life has to offer and considers returning to heaven. His disillusionment with the Great War, where Lucifer was struck down for his jealousy over God’s attention to mankind, is understandable when you consider that brother fought brother, much like during our Civil War. As Remy has started dating again, the idea of finding love once more seems almost unimaginable. In addition to biblical figures and mythological creatures, Sniegoski is quite talented at creating all new species for his stories. In particular, the assassins’ guild that attempts to kill Remy is rather unique, in that they are creatures totally born and bred to fulfill their contracts through killing. The symbiotic relationship between the assassins and their weapons is rather different as well. Overall, Sniegoski writes good mysteries, using old-time religious doctrine within his fantastical stories. Anyone will enjoy A Deafening Silence in Heaven, even without a background in catechism, although it is probably best to read the prior novels to fully enjoy the threads that the author started seeding earlier. Bible tales were never this wildly entertaining when I went to school!